ACE Controls Inc., providing industry leadership with cost-effective world class products to decelerate loads, prevent impact damage, dampen noise, increase cycle speeds and improve product performance. The complete ACE Controls product range includes: industrial and safety shock absorbers, velocity and feed controllers, gas springs, hydraulic dampers, rotary dampers, TUBUS bumpers and V-Sensors for monitoring damaging unit vibration levels. 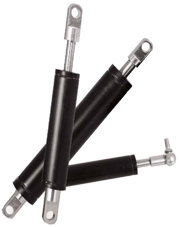 Gas Springs from ACE Controls provide counterbalance motion control for lifting and lowering covers, lids, panels, hoods, hatches and more. ACE Controls gas springs are reliable units designed to handle the demanding needs of the industrial and commercial markets. They are maintenance free and self-contained. ACE gas springs remove the need for muscle power and provide controlled motion for lids, hoods, machine guards, panels and more. Body diameter models are available from 15 mm to 28 mm with forces ranging from 10 N to 2,500 N. ACE Controls gas springs offer a high service life with treated steel piston rod and precision steel body. 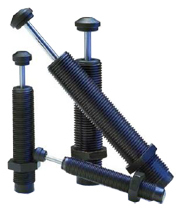 ACE Controls self-compensating shock absorbers are highly engineered, fixed, multi-orifice units that decelerate moving weights smoothly regardless of changing conditions, and require no adjustment. These versatile performers offer wide effective weight ranges for handling a wider range of applications and increased velocities. ACE industrial shock absorbers decelerate loads, prevent impact damage, improve product performance, increase cycle speeds and dampen noise. ACE Controls Hydraulic Dampers are maintenance free, self-contained and sealed units. They are available with body diameters from 15 mm to 40 mm and with stroke lengths of up to 800 mm (40 mm model). ACE hydraulic dampers are durable and feature single or double acting-designs. The travel speed can be easily adjusted and remains constant throughout the stroke. The single acting version is controllable in one direction only, with free flow in the opposite direction. 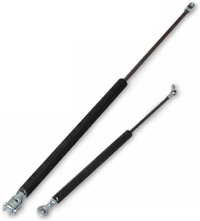 Adjustment is easily achieved by pulling out fully and turning the rod until the desired damping speed is attained. A built-in antilock guard allows adjustments to be made at any damping rate without unit lock up. Clayton Controls is an Ace Controls distributor in California. We offer technical support to help our customers solve their applications.